October is a wonderful time of year to immerse in nature. And outdoor photography doesn't have to be a burdensome affair. I was out shooting on Tuesday morning with an Olympus OM-D E-M5 and just two lenses: the Olympus 75mm f1.8 and the Olympus 17mm f1.8. All fit comfortably in my svelte Lowepro Urban Reporter 150 shoulder bag. 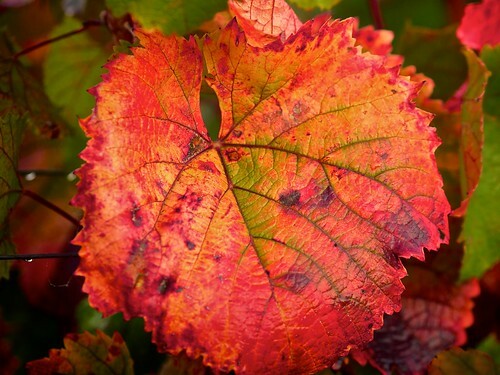 Grape Leaf - Olympus OM-D E-M5, Olympus 75mm lens, ISO 200, F/2 - Photo by Derrick Story. I did include a few accessories, such as a polarizer, small flash, Joby Gorillapod, iPad mini, and a couple snack bars. I dressed in layers so I could adjust my clothing as the environment changed. I wore the Nimble Photographer Walking Man cap to keep my head warm and the low-angled sun out of my eyes. In one of the side pockets of the Urban Reporter, I carried a water bottle to keep me hydrated while working. 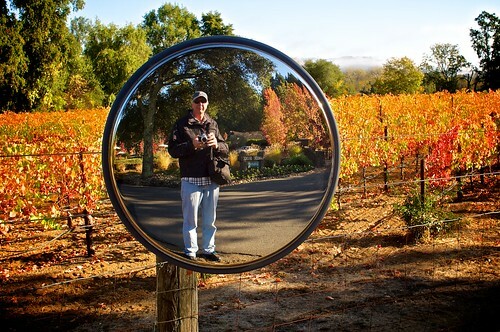 Self portrait with my light-footed nature photography kit. Could I capture every type of nature shot with this rig? Of course not. Some days I take big tripods and big cameras. But other times, I just want to enjoy nature and bring home some images. And those are the times that I love traveling light. This camera kit has a high Nimbleosity Rating. What does that mean? You can learn about Nimbleosity and more by visiting TheNimblePhotographer.com.